You’ve probably wondered what all the fuss is about when it comes to the importance of glass when wine tasting. I mean let’s face it, you can drink wine out of anything right? Well if your wine is cheap and you only want to drink it for “salutary” reasons, then by all means, use any glass you can find. However, if you are looking for the best wine tasting experience, the shape of the glass can enhance your experience. So if you are wanting to maximise your experience in wine tasting next time you are sharing that “special bottle” then a glass is important. To some, drinking wine is like listening to music or eating a delicacy. It is an event to be savored and totally appreciated. You need to keep in mind that there are certain glasses that work best for particular wines. Now you might be wondering why there are so many different shapes of glass for wine in the market. The short answer is that because there are many different styles and types of wine today. If you want to make its taste better, you need to choose a perfect glass that highlights your favorite wine style. A lot of wine tasters know that the right glass is crucial for the maximum enjoyment of wine tasting. The truth is, experts reveal that the design of a wine glass can influence how a wine tastes. Scientific studies even demonstrate how the shape of a glass can affect the aroma of a wine. Whatever is your wine favorite, you can certainly find the right type and shape of glass that will enhance your overall wine tasting experience. 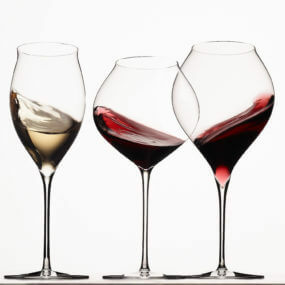 Choosing larger bowled glasses for red wines has a lot to do with alleviating the spiciness or the bitterness of tannin to provide a smoother tasting. Although the taste of wine is a subjective experience, some researches have revealed that selecting the right shape and size glass for the right wine maximises the wine tasting experience. Why not give it a try for yourself and let us know your findings.